This was on my wish list for awhile because I loved the Murder She Wrote TV series. Then it turned up on sale at Audible and … well… what’s a good girl to do? I caved. This is a sweet little romp through a cozy who-done-it, not real “bad guys,” clean murders – a gunshot, poison, an “accident” are the hallmarks of these mysteries. The mystery is of the “who-done-it” variety and it’s usually solved by amateurs although the police are called in. In this case the mystery is of the “closed setting” variety, that is, the characters are isolated in some location, a desert island, a cruise ship or train, a hotel in a blizzard – something like that – and the detective is a very smart amateur. Bain has used an historic mansion as the setting for Ms. Fletcher’s adventure – but a curious twist, one of the features at this mansion resort is that the hosts present a mystery theater performance – you know the kind – a murder is presented as part of the show and the guests are actors while other guests have to figure it out – only the actors know who’s who. So a murder is committed within the setting of a dramatized murder mystery which is rather funny at times. 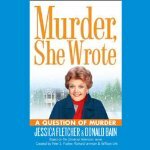 Bain continues the Murder She Wrote series in great style and Darlow narrates well. It is a bit silly sometimes, but fun.